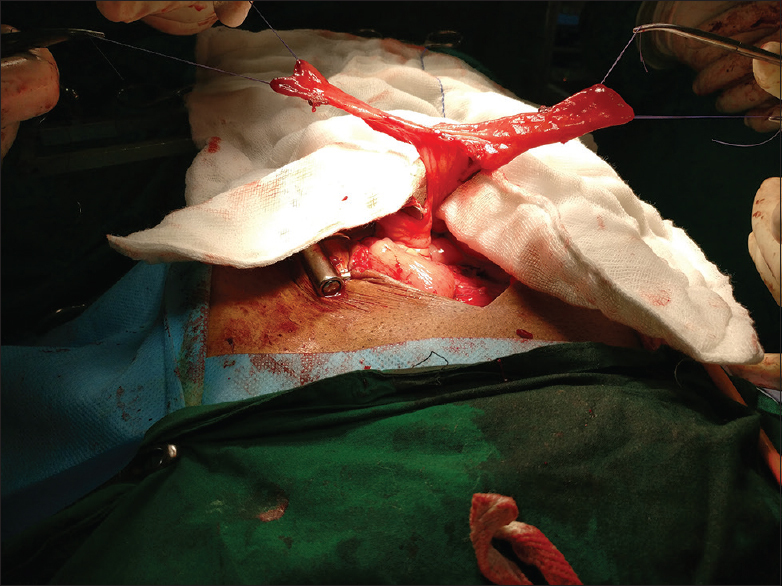 In situations requiring an ileal segment for performing a Mitrofanoff cathetrisable urinary diversion, occasionally a “Double Monti” is needed to achieve a length for the cathetrisable channel to conveniently reach the abdomen of an adult. Casale's tube is an alternative where it can provide a jointless tube with adequate length. The video demonstrates the procedure in an adult with a neurogenic acontractile bladder who had developed a panurethral stricture because of years of self catheterization. “VQZ” technique of stoma formation is helpful in prevention of stenosis. Although Mitrofanoff appendicovesicostomy is the most commonly used technique for a continent catheterisable stoma, it may not be useful where appendix has been surgically removed or is congenitally absent. An ideal channel is short, straight and has a good blood supply. Various methods can be employed to make ileal tube suitable for a Mitrofanoff procedure including a tapered ileal tube or a Monti procedure. A Monti tube is made after detubularization of a 2 cm ileal segment along longitudinal axis and tubularizing it transversely. If the length falls short (as in obese patients), two such tubes can be anastomosed (“Double Monti” or “Full Monti” Figure in the video from 00:08 to 00:30). The advantage of Casale over Double Monti is the absence of central anastomosis (01:11–01:17 in video) which avoids stenosis, kinking, angulation, false passage, and pouch formation. VQZ is a method to prevent stenosis of the tube at skin level which is a common and irritating complication..
A 48-year-old male on clean intermittent self-catheterization (CISC) for acontractile bladder (after surgery for spinal tumor) for the last 26 years developed a pan-anterior stricture. A continent catheterizable stoma was planned for the patient to provide a channel to continue CISC. A jointless 10-cm Casale's tube was made from 4 cm of ileum. For this, the isolated ileal segment was partially transected in the center of the segment remaining short of the mesenteric border. The ends of this incision were continued to opposite sides of the isolated loop, thus opening the ileal plate as a spiral with mesentery attached in the middle. The spiral was then tubularized over a 12 Fr tube [Figure 1]. One end was anastomosed to bladder using Lich–Gregoir technique, and the other end was brought out through the right lower quadrant of the abdomen using the “VQZ” technique. In this technique, in addition to the traditional “V” flap from the stoma which is fed into the spatulation of the catheterizable bowel segment, another skin flap is rotated to cover the circumference of the bowel tube which helps in prevention of stenosis as well as avoids future mucus staining of the clothes. the stoma was catheterizable and continent at 1 year of follow up. Casale technique is a viable alternative to the Double Monti procedure in patients where appendicovesicostomy is not feasible (prior appendectomy or appendix utilized in antegrade continence stoma technique). We have also used it in continent diversions for bladder cancer and exstrophy. Superiority of the VQZ over the tubularized skin flap and the umbilicus for continent abdominal stoma in children. Landau EHet al. J Urol. 2008 Oct; 180 (4 Suppl):1761-5. Casale AJ. A long continent ileovesicostomy using a single piece of bowel. J Urol 1999;162:1743-5. Landau EH, Gofrit ON, Cipele H, Hardak B, Duvdevani M, Pode D, et al. Superiority of the VQZ over the tubularized skin flap and the umbilicus for continent abdominal stoma in children. J Urol 2008;180:1761-5.